Ah Christmas. Family, holidays, good weather (sometimes! ), presents and, of course, copious amounts of food. 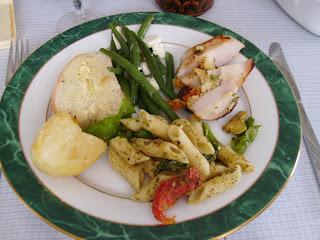 A time for indulgence in some of the very best of cold and cooked dishes to grace a dining table. At Chez Regán this year we all pitched in, and here is a sample of the results: The requisite ham is yet to be brought to the table (I'm not someone who progresses from ham lover to groaning 'no more' a couple of days after Christmas - I love the stuff and miss it throughout the year!). Foregrounded is a surprisingly successful stuffed turkey breast. The plan was to butterfly it, stuff it, then roll up it up in a roulade, courtesy of a Terry Durack recipe. The carving didn't go to plan, however, so instead I made the ultimate club sandwich, sans bread. The stuffing was a milieu of what took my fancy: breadcrumbs, an egg, grilled apple, apricots, parsley, rosemary, oregano and onion. Roasted for an hour it came up an absolute treat. As with all good celebratory meals it didn't stop there. SG's contribution came with dessert. He's a dab hand with meringues and this year branched out to go the full pavlova. Merry Christmas! How good does that look? 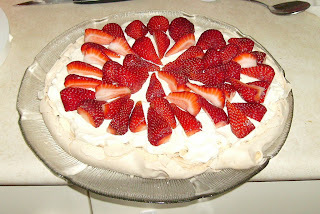 And it tasted as divine, with wonderful meringue crispiness surrounding a gooey interior. 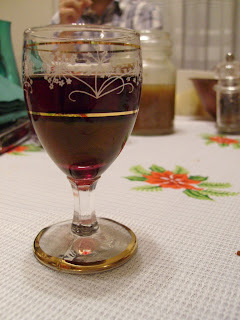 To end the day, there was happily some port to hand, as well as the port glasses gifted to my parents at their wedding, and which once held my first ever approved alcoholic drink. Afterwards, as tradition dictates, it was time to turn in, contentedly stuffed, at an unreasonably early hour and get up on Boxing Day to do it all again. For me christmas day was a fantastic group effort with everyone producing at least one dish and because of this i never new what to eat next. there was just so much choice. Glad you enjoyed it so much! 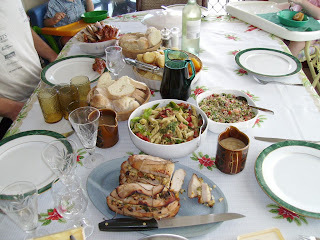 My sister said much the same thing: it was one of those great meals, made all the better from everyone being involved.